The Nasdaq completed its first 10 week winning streak in nearly 2 decades dating back to 1999. Certainly it has been an impressive move, and one can fulfill their bias, but bulls are in control at the moment. The tech rich index has reclaimed its 200 day SMA, and 4 of the 5 sessions this week traded in a taut fashion with intraday ranges of less than 1%. It is very interesting the 2 most influential groups within tech, the semis and software have gained almost identically with the SMH and IGV advancing 31.7 and 31.8% respectively top to bottom from the lows made in late December. 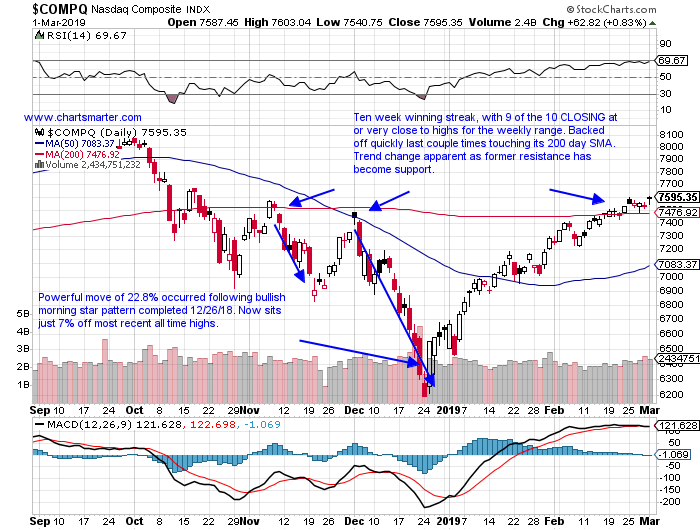 With that type of action more gains are not out of the question, as the Nasdaq potentially has another 7% until it retests prior all time highs following the precipitous 23.6% slump the weeks ending 10/5/18-12/28/18. The security software space is white hot at the moment, perhaps one of the strongest subsectors in any group of the market. As the smartly named ETF HACK trades just 1% off most recent all time highs, top holding CYBR has advanced 48% thus far in 2019, not a typo. Some names in the fund, forgot to get the memo. Below is a ratio chart of FEYE in comparison to HACK, and the former trades a wobbly 18% off most recent highs. 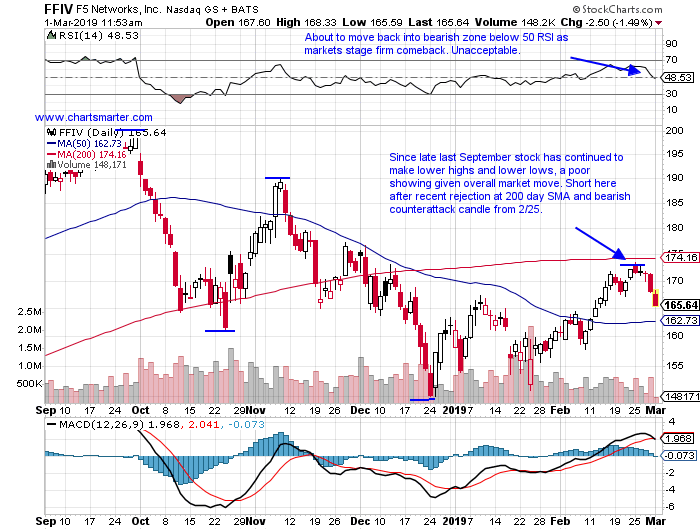 It registered a bearish death cross this week and has been in limbo since encountering trouble at the very round 20 number late last year (two of the sessions CLOSED just one penny above 20 on 11/30 and 12/3). As always focus on the leaders. There has been some rebirths of "old tech" names with nice action from the likes of VMW and MSFT, and even INTC to a degree. But there are always exceptions, as Thursday witnessed a plunge of 17.3% for HPQ after earnings, and now sits 28% off most recent 52 week highs. 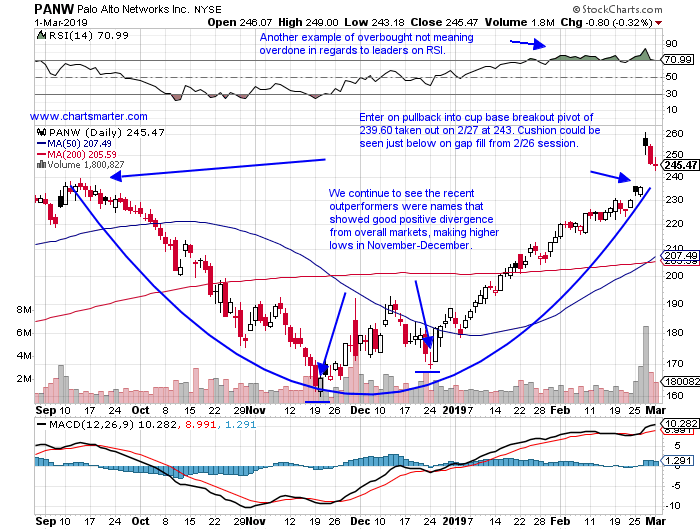 Below is the chart of another laggard JNPR, and how it appeared in our 2/19 Technology Report. This week it lost ground everyday, and showed weak relative strength dropping 2.1%. 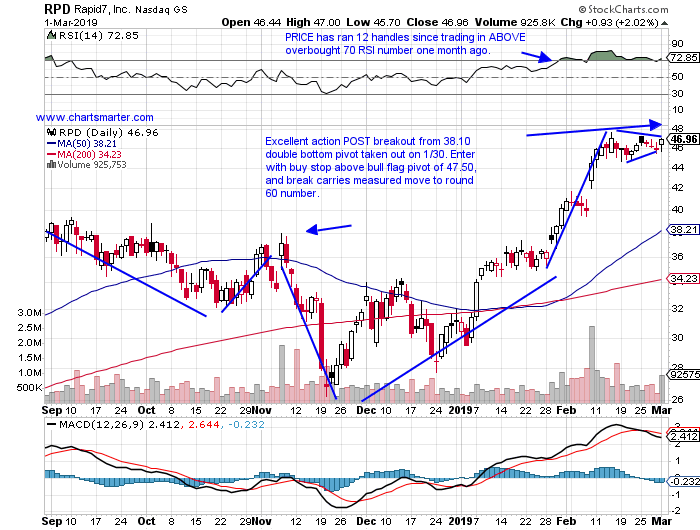 It filled in an upside gap and its trade is very wide and loose, hallmark bearish characteristics. Security software play higher by 30% YTD and 41% over last one year period. Higher 13 of the last 14 weeks, and just recorded bullish golden cross. 6% off recent all time highs. 10 week losing streak weeks ending between 9/21-11/23/18 that slumped 32.2%, now in the rear view mirror. Enter on pullback into recent cup base breakout pivot of 239.60 at 243. Entry PANW 243. Stop 229. Technology payments play higher by 27% YTD and 18% over last one year period. Up 9 of last 10 weeks, with only down week ending 1/25 CLOSING at top of weekly range. Just 1% off most recent all time highs, 4 weeks ending between 1/18-2/8 all CLOSED taut within just 1.67 of each other. 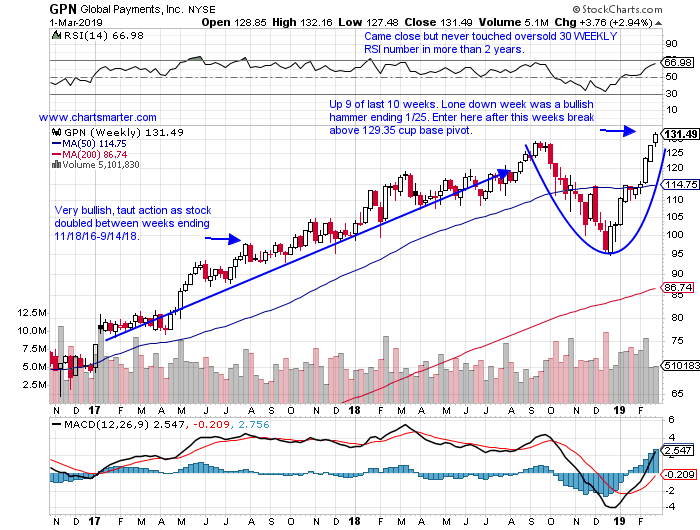 Enter here after this weeks break above WEEKLY cup base pivot of 129.35 in pattern 5 months long. Entry GPN here. Stop 127. Software leader higher by 51% YTD and 82% over the last one year period. Current 10 week winning streak, including week ending 2/8 that rose 9.1% in second largest weekly volume ever. FOUR consecutive positive earnings reactions rising 11.4, 10.8, 8.8 and 2.2% on 2/8, 11/7, 8/7 and 5/9/18. Enter with buy stop above bull flag pivot of 47.50. Break carries measured move to round 60 number. Entry RPD 47.50. Stop 45.50. Internet play higher by 14% YTD and 26% over the last one year period. Down 1.4% this week ending 7 week winning streak. Has digested huge move of 254.6% between weeks ending 2/12/16-9/14/18. Enter on gap fill from 2/20 session at 74. Recent action could be considered a handle on current cup base. Add to through 77.50 pivot. Entry GDDY 74. Stop 71. "Old tech" telecommunications equipment play up 3% YTD and 14% over the last one year period. Down 11 of the last 22 weeks and this week demonstrated weak relative strength falling 3.2%. Was stopped at very round 200 number week ending 9/28/18, which was preceded by 72.9% move higher prior 11 months. 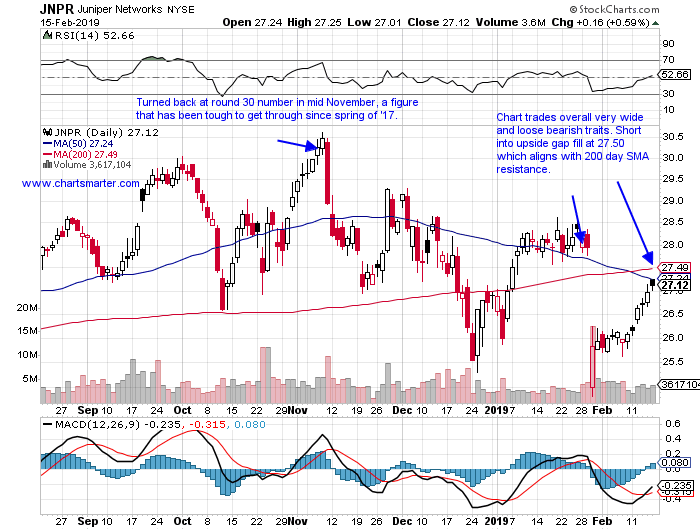 Enter short here after recent rejection at 200 day SMA and bearish counterattack pattern completed on 2/25. Entry FFIV here. Buy stop 173. Buy pullback into recent cup base breakout PANW 243. Stop 229. Buy after recent WEEKLY cup base breakout GPN here. Stop 127. Buy stop above bull flag RPD 47.50. Stop 45.50. 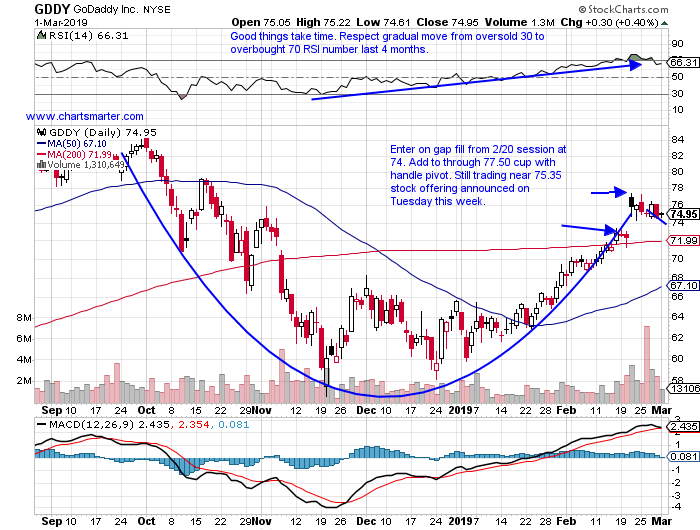 Buy gap fill GDDY 74. Stop 71. Short after recent bearish counterattack pattern FFIV here. Buy stop 173.